Associated Press A few jewelry findings and two skeins of embroidery thread are all you need to create these colorful handmade earrings. 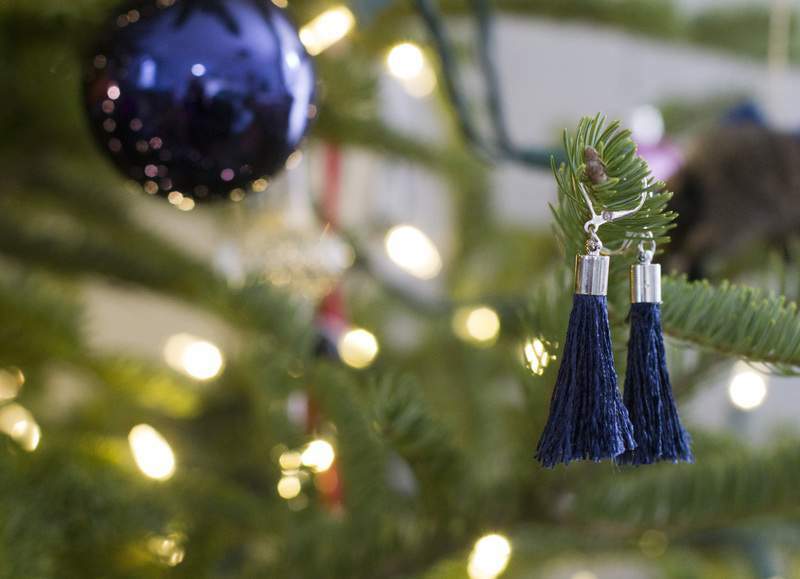 CONCORD, N.H. – Fringe is in fashion and tassels are trendy, and they're not just on pillows and clothing. 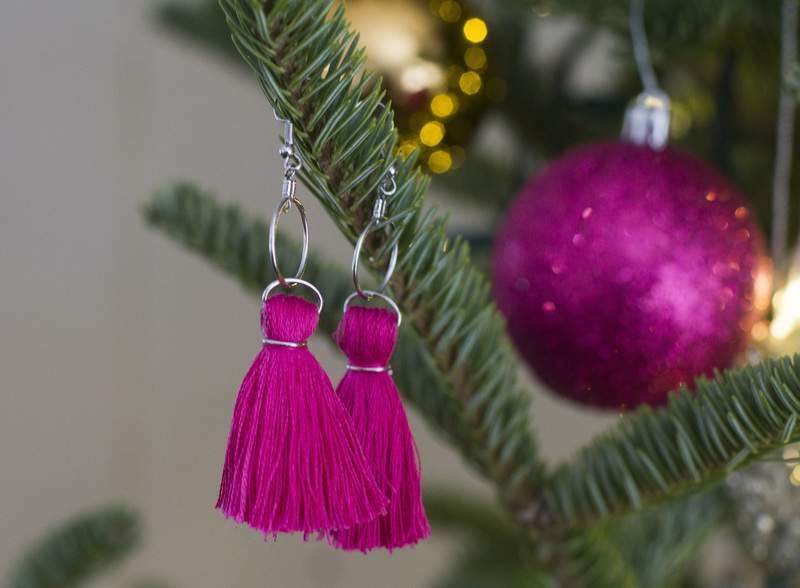 Handmade earrings adorned with embroidery floss make quick, inexpensive holiday gifts, and they're easy to customize according to the recipient's favorite color. Browsing aisles of jewelry-making supplies at craft stores can be a bit overwhelming. The embroidery aisle is more straightforward, though choosing the perfect colors can take some time. But with each skein of thread costing about 60 cents, you can afford to get a few extras for backups. Even figuring out which tutorials to test is a bit of a chore: I found instructions for earrings sporting tiered tassels, multiple mini-tassels arranged along hoops and a variety of other DIY dangles. But with only a few days left until Christmas, time wasn't on my side so I quickly narrowed my list down to three options. Two featured embroidery floss while the third used pre-made fringe to form the tassel. In all three cases, I found combing the finished tassels with a fine-tooth comb really helped separate the strands of floss and fluff them out a bit. First up was a tutorial on a blog called Charleston Crafted, written by a couple remodeling their first home. This method looked like the simplest one I found, because it didn't involve fussy cutting or tying embroider thread. 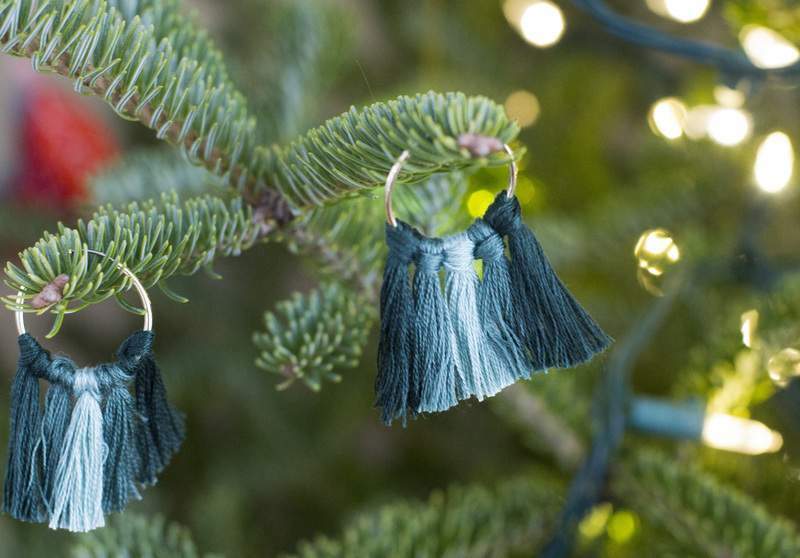 Instead, fringe trim that can be purchased by the yard (though you'll need only a few inches) is rolled up and glued into a little metal cap that attaches to an earring wire. But I couldn't find the “jewelry end caps” called for in the instructions – the closest I could find was a “toggle clasp kit” that appeared to be similar. I think my caps were smaller, and the top of my fringe was thicker, which meant it was a bit tricky to roll it tightly and then glue it in place. Still, this was a pretty easy process. A blog called “Style & Forks” promised “The Easiest Tassel Earring Tutorial,” and while it was indeed the easiest of the three I tried, it wasn't quite as easy as it looked. This method involves simply tying embroidery floss onto hoop earrings – no glue, no fiddly jewelry findings. So far, so good. But the instructions also call for wrapping the thread around two fingers – without saying how many times – and I found that resulted in short lengths of floss that were difficult to tie. Instead, I wrapped the thread around four fingers six times, which gave me enough to work with. The tutorial also doesn't explain how to tie the embroidery thread to the hoop. I found better instructions and photos on a website for Darice, a company that makes craft supplies. Once I got the hang of it, this method was quick, even though it involved adding multiple tassels to each hoop. This method was inexpensive, because it didn't require pliers or glue. My final attempt was based on a tutorial on the website Made in a Day. This method uses an entire skein of embroidery floss per earring, which makes for a chunkier tassel and also means no measuring. The floss is looped over an oval jump ring and tied to create the tassel, which was a bit harder than I expected. The instructions say to use glue, but not exactly where, and I ended up with some hot glue squirting out the side of my tassel top. This method required the most pieces, and might be the most difficult if you're not used to working with tiny jump rings and pliers. But once proficient, you could whip up many pairs because the packages of supplies contain enough for dozens.